Available in a wide variety of crisp and vivid colors, our Crinkle Cut Eco-Spring Fill takes up more space so you can use less in your gift baskets and boxes. Contains 100% recycled paper. Accordion shaped shred, which expands, is perfect for heavier weight gift basket products. 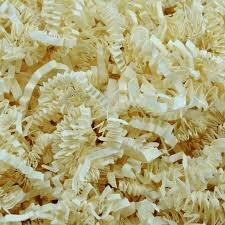 Crinkle Cut is a Trademark of Spring-Fill Industries, Inc. A 10 lb. box of Fill measures 24 x 16 x 11". Natural brown Kraft Crinkle Cut Eco-Spring paper fill takes up more space in your box or gift bag so you use less.